DJ Retro Rick’s stacking blocks made their debut at the Lovelton Hotel last summer. On Oct. 13, two couples visiting the Lovelton on Games & Trivia Nite accomplished an unprecedented feat when they ran out of moves dismantling the stack to build their tower, then methodically dismantled the tower and put the stack back together without a collapse. The reigning champs are (above, from left) Wayne and Tina Johnston and Nancy and Charlie Verbryck. When DJ Retro Rick (aka – Rick Hiduk) packed his truck for Games and Trivia Nite at the Lovelton Hotel last Thursday, two vinyl shopping bags belted into the passenger seat held neatly-packed 10-inch two-by-fours. Rick didn’t know at the time that the props riding shotgun would be enjoyed by so many in a wide area over the course of three nights. Stacking blocks, frequently referred to by the brand name, Jenga, have been around for years. It was British-born Leslie Scott, then living in Ghana, who produced the first patented sets in the early 1980s. Rick’s set was made by then Tunkhannock High School tenth-grader Joan Kavalik of Jenningsville. She was showing him some items that she had made in wood shop, in which she received an A, and Rick asked her if she could build a giant version of Jenga for him. Joan immediately set to searching for instructions on her phone while simultaneously texting her grandfather for prices on wood. She produced and estimate for the project within 10 minutes, and Rick accepted and gave her a deposit. Over the next few weeks, Joan cut, sanded, and hand-oiled the pieces with some help from her parents. Her stacking blocks became an instant hit in local bars and at private parties. After the Lovelton Hotel in Wyoming County, Rick set his sights on the Hayloft in Lawton in Susquehanna County for Flashback Friday with DJ Retro Rick. The crowd that met at the door were ready to dance to ’80s music and other classic hits. As they danced, Rick snuck the stacking blocks in the side door and set them up on a nearby table. 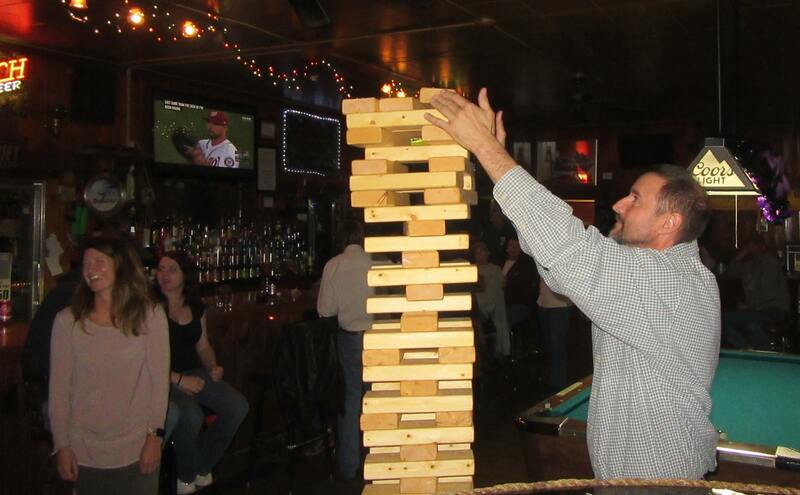 As he worked the room for requests, he pointed out the waiting stack and encouraged patrons to give it a try. 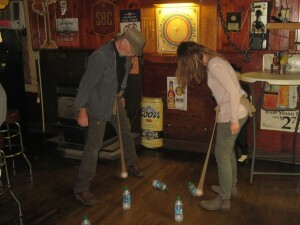 At least three rounds ensued among the enthusiastic players (above) before Rick slid the blocks back in their bag for the night. As he mused the next evening’s gig at the Marie Antoinette Inn west of Wyalusing in Bradford County, he wondered if his Saturday Night Dance Party patrons would get into the game there as well. “No harm in trying,” he thought. The game was once again received well, played by numerous people (above) while dancers filled the floor nearby. 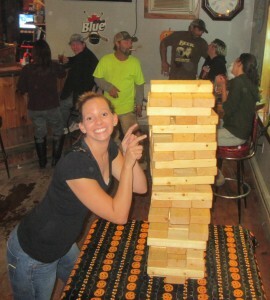 Rick has no doubt that the stacking blocks helped to retain the crowd at each venue. Players dig in for the duration of the game and take it very seriously. 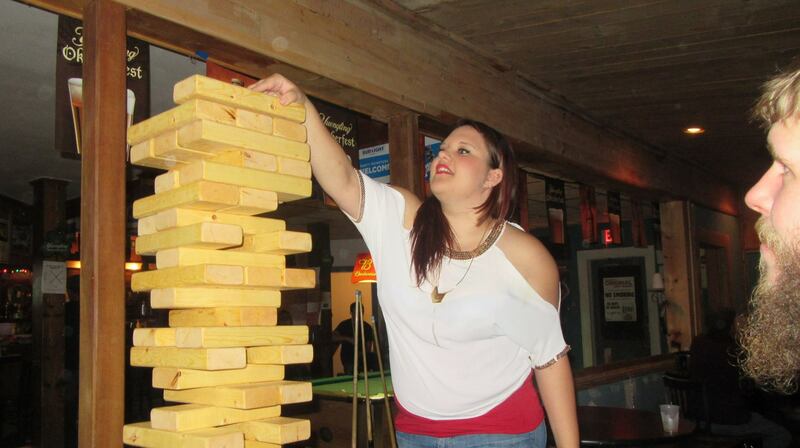 And spectators become spellbound as they watch the dismantling the stack and building the precarious towers. Indeed, the stacking blocks are not the only trick up Rick’s sleeve. 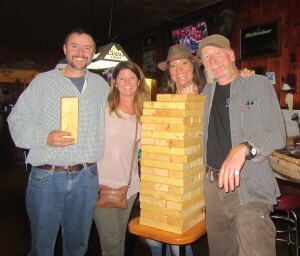 At the Lovelton Hotel, patrons not building the tower on Oct. 13 were simultaneously playing How’s it Hangin’ (above) and other games or shouting out answers to pop-up trivia questions. Rick also borrows on classic game shows like Let’s Make a Deal, Jeopardy, Match Game, and Tattletales for his contests. One game on which Rick put a unique spin, to the delight of bar owners and managers, is The Menu Price is Right. Rick builds a meal from the venue’s menu and pits three players against each other to guess the prices without going over. The patrons are reminded of the variety of food on the menu, and the grand prize is often a gift certificate from the establishment. Rick comes up with the ideas, and the prizes are supplied by management, often with help from their beverage distributors and other promoters. If the establishment has invested in new apparel to sell to customers, offering up a T-shirt or two as a prize is great advertisement. Every crowd is different, and the owners and managers usually understand the patrons they already have and those whom they want to draw in. Rick works with management to develop a format that will work for them. When a bar owner said, “Our customers like karaoke, but they get bored with it quickly,” Rick offered Trivia-oke, a combination of singing and pop-up trivia questions that has worked well in a number of establishments. While DJ Retro Rick’s contests and fun shenanigans often get their test runs in drinking establishments, they can easy be tailored to company parties, wedding receptions, and family reunions. For more information and available dates, call Rick at 570-833-8056.